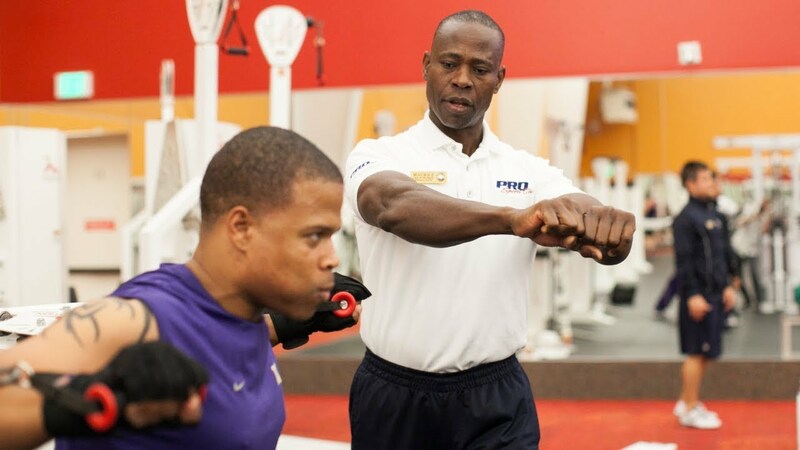 With unmatched expertise, education and qualifications, the Personal Trainers at PRO Club can help you define your fitness goals and create a roadmap to help you get there. Available at PRO Club Bellevue, Seattle and Willows Road locations. Every member enjoys a complimentary 55-minute Personal Training session. It’s a great way to learn how to use the club’s equipment, and you’ll receive a personalized workout you can do on your own. Missed appointments can result in a $15 fee. Using scientific data, your trainer will develop a genetically-optimized fitness plan personalized to help you reach your goals faster and be the best you can be. Includes personalized one-on-one consultation. Provided at no cost with eight PRO Personal Training Sessions. Get to know PRO Club with a personalized training program with one of our trainers. This package includes 12 personal training sessions and a Group Fitness 10-Pack. Offered as a one-time purchase only. Kick off your PRO membership with a friend or family member in a series of two-on-one personal training sessions. Includes a Group Fitness 10-pack. Flexibility is a critical component of any fitness program. With one-on-one stretching in our 10-pack stretch, you’ll enhance injury resistance, improve range of motion, prevent the loss of flexibility that occurs with aging and more. Expiration 90 days from date of purchase. Flexibility is a critical component of any fitness program. With one-on-one stretching in our 5-pack stretch, you’ll enhance injury resistance, improve range of motion, prevent the loss of flexibility that occurs with aging and more. Expiration 60 days from date of purchase. Work out more effectively and reach your full potential by unlocking your genetics. No matter what your fitness level or exercise history, your genetics can help you dial in precisely what your body needs. Eliminate guesswork, fine tune your workout routine and save time. Genetically-personalized fitness training provides valuable insights for you and your PRO Personal Trainer. Using scientific data, your trainer will develop a genetically-optimized fitness plan personalized to help you reach your goals faster and be the best you can be. Using scientific data, your trainer will develop a genetically-optimized fitness plan personalized to help you reach your goals faster and be the best you can be. Includes personalized one-on-one consultation. Using scientific data, your trainer will develop a genetically-optimized fitness plan personalized to help you reach your goals faster and be the best you can be. Includes personalized one-on-one consultation. Provided at no cost with $720 eight PRO Personal Training Sessions. Adam draws his knowledge from his background in sports including wrestling, football, track, soccer and baseball. While in college Adam worked with Oregon State University athletes at the sports performance center as well as general population in the recreational center setting. Adam believes that regardless of the desired outcome exercise should be an enjoyable experience that develops self-worth and confidence in one’s self. Adina is a passionate Personal Trainer that understands the challenges of not only starting but also maintaining a healthy lifestyle. She strongly believes in the necessity of exercise, which is why it is an integral part of her day to day activities. It was her dedication to losing weight and recovering from injuries sustained in a car accident that led her to discover a true passion for fitness and the desire to help others achieve their goals. Adina thinks diversity is key to keeping things interesting in the gym and designs programs that achieve the client’s desired goals in a fun and rewarding way. Having grown up doing ballet competitively for 19 years and graduating with a B.S. in Exercise and Sports Science, Alexa has always been passionate about the body, movement, and all things related to health and wellness. She believes in the importance of a healthy and balanced lifestyle to achieve a strong body and mind. As a trainer, her goal is to not only educate clients about the importance of physical activity, but to also help them realize the impact that being active can have on one's life. Ally's mission as a Personal Trainer is to inspire and provide guidance to individuals so they are better able to achieve their personal fitness goals. She wants to do this by educating, encouraging, and motivating her clients as well as sharing her passion for fitness. Ally grew up participating in sports including swim team, gymnastics, dance team, and collegiate cheerleading. Amanda is passionate about health and fitness, and enjoys working with people of all ages and fitness levels. She appreciates the power of education and believes that developing a mind-body awareness during one’s movements will increase one’s quality of life and daily experience. Amanda cares deeply about positioning for efficient muscle recruitment, facilitating air correctly for diaphragm function and balancing one’s neurological system. Ashley is a Seattle native who graduated with a Bachelor’s of Science degree in Kinesiology from Washington State University. She hopes to inspire those around her to focus on their wellbeing through a healthy lifestyle and sustainable activity. She believes fitness and nutrition are essential to positive self-worth while fulfilling all aspects of your wellness. Exercise should have purpose, be effective, and enjoyable! Ashley developed a strong understanding of the human body. With 6 years of experience training and coaching, Ayden brings a diverse background and unique approach to fitness. With a primary focus on functional movement and quality of living, he provides personalized programs that approach wellness in a holistic manor. With Ayden’s passion for helping others and his knowledge of exercise, he is ready to help any who are willing to accept the challenge. He has a background in group training, individualized programs, sport-specific training, and injury reduction. Ben has been lifting weights and designing his own workouts since the age of ten when he was gifted a weightlifting set! Since those formative years, he’s continued learning the ever-changing tenets of fitness and exercise through self-experimentation and education. Ben spends a significant amount of time reading about the latest information regarding health, exercise, and performance, and puts all of this information to good use, not only for his own workouts, but especially for his clientele. Ben became interested in Personal Training through an injury that occurred during wrestling while in high school. He learned that through rehab exercise, an individual can return to the sport that they love. Ben is passionate about helping everyone achieve their fitness goals through a training program that is fun, dynamic, and customized to the client. Whether an individual is young or old, recovering from an injury or preparing for an event, he believes everyone can benefit from exercise. Brad Flolid is specialized in skiing, soccer, baseball, football, and track. He is experienced in knee and shoulder post-rehabilitation. He enjoys mountain biking, backpacking, Alpine skiing, bow hunting, and coaching youth sports. Brandon has been studying exercise for the last thirteen years. He’s a firm believer in continued education in the health and fitness industry to always strive for the best techniques in order to help people progress. Living by example is important to him, not only for himself but to also influence others to improve their own health and wellbeing. Exercise is more than just physically moving the body, it requires mental toughness. You must first conquer the mind to be able to achieve the body you want. For the past two years Brandon has been working as a rehab specialist where he has developed a greater understanding of the importance to incorporate balance in a workout routine. As a rehab specialist Brandon primarily worked with clients who suffer with back problems and a lack of core strength and overall flexibility. Our back and core are our base from which the rest of our bodies move, and it is important to address any issues there to prevent injury and to improve overall fitness and performance. Everyone is unique and has different goals, likes and dislikes, so he feels it is important to create individualized programs. Brandon believes you should never fit the individual to the exercise but the exercise to the individual. To Brandon, exercise isn’t a short-term experience. It is a life time commitment and he loves being a part of sharing the wonderful world of health and fitness with others. As a Division 1 Rugby player and outdoor enthusiast, Bree has made fitness a defining factor in her life. Her purpose is to keep you motivated to improve life! She has worked as an exercise specialist in rehab, assisted living facilities, and in a university setting. She is passionate about taking a whole-body approach to fitness for clients of all levels. She is a certified rock-climbing instructor and recently finished a manual on how to train for rock climbing. Bree is a friendly and caring trainer that will do whatever it takes to see you succeed! Outside of work Bree enjoys hiking with her dog, rock climbing, and finding the newest local brewery. Exercise was first introduced into Brett’s life at an early age when he was competing in Track and Field and Soccer. Brett loved fitness and living a healthy lifestyle so much that he decided early on that he wanted to make a career out of helping people and changing their lives for the better through fitness. Brett received a BS in Kinesiology at Washington State University and have gained three years of experience working with people of all ages. Brooklyn has always had a passion for health and fitness. Her extensive background in the fitness industry has inspired individuals of all ages, backgrounds and fitness levels to make a positive lifestyle changes. Brooklyn will customize fun yet challenging programs to meet your specific needs. She believes that with motivation, a proper support system, and education, anybody can achieve their fitness goals. Her hobbies include kickboxing, snowboarding, volleyball, group fitness, running and football. Buzz has 25 years experience and enjoys working with those interested in weight loss, cycling, tennis, golf, knee and shoulder post-rehabilitation, and pre-/post-natal. Cameron's has an extensive background in sports and functional exercised from schooling at Western Washington University. After graduation, he developed an interest in weight loss and now incorporates weight loss and functional training into his work. As a trainer, Cameron's upbeat and positive personality can help every client achieve his or her goals and find enjoyment in exercise. In his spare time, he enjoys hiking, weekend getaways, and spending time with friends and family. Carrie has a passion for helping people set and reach their health and wellness goals, and will meet them where they are in order to help them be their most successful. She has worked with a wide variety of people, personalities, and fitness levels in individual and group settings, and it is a thrill for her to see people progress under her instruction, becoming stronger with more energy. Chad is passionate about helping others, especially when it comes to health and fitness goals. He works with people of all ages and backgrounds. He strives to make exercise fun, but also challenging. After a training session or Group Fitness class with Chad, his enthusiasm for fitness and health will leave you feeling accomplished and motivated to take on anything. With an education in Exercise Science, and a background in athletics, Chad is very versatile and strives to help clients reach goals. Chris has been in the fitness industry since 2006 and a trainer/coach since 2008. He believes that anyone can achieve their strength and fitness goals with the proper motivation and education, and he’s committed to helping others exceed their goals while having fun. He enjoys CrossFit because of the progressive emphasis on movement quality, functionality and intensity, all while being surrounded by an energetic and passionate community. Christy has been in the fitness industry since 1997 and an athlete her whole life. She enjoys helping people understand how to adapt their fitness program to enhance their quality of life through education, functional training and core strength and stability. Christy specializes in weight loss, pre-natal/post-partum, rowing, running, injury pre/post-rehabilitation, and juniors. She enjoys running, Pilates and being a mom. She is exclusive to Seattle. Limited Availability. Cody has experience in strength, conditioning, and weight loss programs, and has helped his clients reach their goals with smiles on their faces. Cody has also been involved in many different sports such as football, baseball and track. He became interested in personal training after his personal journey with weight loss and decided that he could also help others reach their maximum potential. He loves working with people of all ages, and will always show up with a smile on his face. Connor possesses the firm conviction that fitness and exercise is not an activity, but a way of life. Connor’s passion started as a hobby and has matured into a career in which he has the opportunity and privilege to change people’s lives for the better. He trains people from all walks of life and fitness levels, and believes no goal is too big. Connor specializes in body fat reduction, lean muscle mass growth, physique training, functional movement training, and bodybuilding. Connor is passionate about guiding and supporting people in their journey toward achieving their health and fitness goals. Drawing from his professional education and experience in working with those new to exercise and fitness enthusiasts, he has a great desire to provide the best fitness experience to his clients. He enjoys being a source of information and motivation to transform, challenge and enhance his clients' fitness levels and allow them to maximize their body's capability. Dan is an avid believer that anyone can improve their quality of living through exercise. Dan specializes in strength training for performance. He is a current state record holder in the sport of powerlifting. With a background in powerlifting, sports specific training, and injury rehabilitation, Dan utilizes strength training methods to help clients achieve their goals. His personal interests aside from weight training are tennis, hiking, and the outdoors. Daniel strongly believes in the power of positive thinking and encouragement. He specializes in training athletes for peak performance. As an experienced collegiate football player, Daniel understands how to motivate people to ensure they reach their maximum physical potential. Having undergone his own ankle surgery, he also enjoys helping people recover from injury. Daniel feels that fitness is something everyone should enjoy. He welcomes and encourages everyone to enjoy an active lifestyle. David’s coaching addresses imbalances and keeps his clients accountable. This increases performance, prevents injury and allows the most out of what they enjoy. David has gained additional knowledge about coaching those at higher risk, whether dealing with mental or physiological conditions, or those who may need specialized exercise prescription. He is now focusing on expanding his understanding of advanced weight lifting techniques and nutrition science. Dean is a senior trainer. He has over 15 years experience in the fitness industry and enjoys working towards helping clients achieve any health and fitness goal. Specializing in functional training, Dean is also a competitive cyclist with experience in sport specific training for endurance sports including cycling, swimming, and sprint distance triathlon. Pro Personal Trainer of the year 2008! Due to a full schedule, this trainer is unable to accept jumpstart clients. Deborah has been athletic most of her life and was nationally ranked in cycling and speed skating. She now enjoys CrossFit, running, hiking, bicycling and golfing. Deborah strives to continuously learn and grow in the fitness and nutrition industry. She believes that true wellness incorporates a holistic lifestyle approach that is essentially a series of choices and habits. These include not only exercise, but also proper nutrition, sleep, hydration, mobility, mindfulness, and stress management. Dillon has a vast background in sports and played collegiate level football while attending PLU. He completed his B.A. in Kinesiology and has since upheld an interest in empowering others to take control of their fitness lifestyle. He has taught sport and leadership classes at ‘Iolani School in Hawaii and coached many sports teams. Prior to becoming a Personal Trainer, Dillon started off as a Fitness Specialist at PRO Club and has cultivated great relations with regulars. As the Head Strength and Conditioning Coach at Eastlake High School in Sammamish, he oversaw the development of 10 different sports teams. He has been a Position Coach for football and is currently the Head Sprints Coach for Eastlake. Dirk has trained athletes who range from the youth sports level to the professional ranks including many Division 1 football players. He is currently the Washington State Director for the National High School Strength and Conditioning Association. Dominic’s passion and mission unite when he works with people of all ages by helping them in their journey by inspiring, educating, training, and encouraging them to reach their goals through adopting a holistic lifestyle. He discovered his passion to work in the fitness industry and preventative health after participating in multiple internships in wellness and personal training. One of Dominic's greatest joys is having the opportunity to build relationships with people and walk with them throughout their fitness journey; encouraging them to be the best version of themselves. Doug is the Head Coach at CrossFit Bel-Red. Doug has an innate passion for health and fitness. He uses this passion to motivate and inspire others to feel the same way. Doug has experience and expertise in a wide variety of training programs including: weight reduction, sport-specific, strength and cardiovascular training. Doug brings fun and excitement to every training while providing an efficient and effective program to help people reach their personal goals and take them to higher levels of fitness. Dray holds certifications in Olympic weightlifting, cycling, TRX and CXWORX. He has dedicated 3 years to the Eastern Washington Eagles football team as D1 Strength and Conditioning Coach. Dray enjoys working with people of all ages and giving them fun, challenging and efficient programs to allow them to reach their fitness goals. He's well invested in his clients and their specific needs and goes about and beyond to make sure they're able to achieve their goals. Elyse has worked with clients of all ages and fitness backgrounds. Elyse desires to help clients meet their fitness goals in a fun and safe environment. She grew up playing basketball, volleyball, and running track, and understands that staying active is the key to a healthy lifestyle. Elyse believes that each client is unique and deserves a wellness plan that meets their specific needs and fitness goals. In her spare time she loves to hike, walk Green Lake, and frequent the many coffee shops in Seattle. Eric’s life changed immensely when he began exercising. He wants to help others find the same positive impact and is a firm believer that through exercise, we can improve all aspects of life, including physical, mental and social. Eric utilizes his diverse knowledge of exercise by optimizing exercise plans for long-term success. He believes that by doing this, he can help achieve a wide variety of health and fitness goals. Previously a Strength and Conditioning coach, Eric specializes in Sport-Performance and Strength-Specific-Goals. Erik is specialized in sport specific training and he coaches football, wrestling, and baseball. He has been in the industry 15 years and is experienced in weight loss, low back and juniors. After dabbling in several sports throughout her youth, Erin didn’t find her true passion until after high school when she started power lifting. Since then, she’s seen huge success competitively, breaking state and national power lifting and strongman records. Erin is a firm believer that the secret to fitness success is finding something you enjoy. She realizes that for most people exercise can feel like a chore, but she’s determined to help others fall in love with the process like she did. When she’s not in the gym, Erin enjoys cooking, travel, and hiking. Gerin believes that exercise is meant to make the activities of everyday living easier and one should go out and do everything they love. Fitness became a part of Gerin's life when he started participating in football and wrestling. From them on, no matter how many setbacks he had from injuries, he always came back and pushed himself to be better than before. Gerin possesses an array of knowledge that he acquired from his personal experience, as well as from Western Washington University. She recently graduated with a degree in Kinesiology from Washington State University, and is a certified personal trainer through the American Council on exercise (ACE). Her workouts are designed around each individual and focus on the functional aspects of exercise to set her clients up for successful outcomes. Gina loves seeing the progress and enjoyment her clients experience throughout their training, and will be there motivating them throughout their fitness journey. Haley believes that everyone is capable of reaching their fitness goals and finds pleasure in helping people reach those aspirations by tailoring each person' training program to fit the individual. Haley is passionate about living life well and wants people to have the ability to do day-to-day activities and other fun events that interest them. Haley has a special passion for working with pre and post-natal women and provides an encouraging and comfortable environment to all. Hannah’s uses a holistic approach and is a big proponent of using exercise as a form of medicine. Hannah provides a comfortable and welcoming environment to all and her training philosophy emphasizes the importance of utilizing proper techniques and safety. She has worked with a variety of clientele, including Division I athletes, general and special populations. Hannah’s goal is to set everyone up for success and help individuals meet their short and long-term fitness goals. Growing up, she participated in a variety of sports, such as track, basketball, soccer, and softball. Hollie believes with the proper education and the right motivation, anybody can achieve their goals. She has worked with a wide range of clientele from young children to collegiate athletes and can customize each program to meet the specific need of each individual. Hollie also specializes in TRX, small group training, injury prevention, youth, and accepts packages. Jake believes that knowledge is power, and therefore he seeks to not only train, but educate his clients to the best his abilities using the most up-to-date scientific methods and principles. He has a passion for training his clients who come from wide-ranging ages and medical histories, and has experience training himself and his clients in bodybuilding and power lifting. Jake is continually looking to improve himself and thereby improve his client’s experiences in health and fitness. Jake loves incorporating corrective and functional exercises in his programs to help people stay pain free and maximize their potential. Additionally, with backgrounds in sports and Olympic lifting, Jake has a competitive drive and significant knowledge about kinesiology and sports specific training. Whether you are trying to stay healthy to maximize enjoyment of life or you're training for something specific, Jake would love to share his knowledge and work alongside you to help achieve your fitness goals. James is a Senior Personal Trainer who has been with PRO Club for over 10 years and was PRO Club’s Personal Trainer of the Year for 2011. He is a certified Kettlebell instructor (SFG-Strong First). James enjoys working with partner training clients and small groups. James is experienced in injury rehabilitation and injury prevention. His current interests are basketball, squash and throwing weights around. James is also a FMS specialist. James enjoys working with people from all walks of life and strives to make every workout as fun, challenging, and safe as possible. James has a BS in Kinesiology from Western Washington University, and experience in strength training as well as functional and interval training. He enjoys seeing both the physical and emotional benefits his clients experience as they fulfill their fitness goals. As a former Division 1 athlete in volleyball and basketball, an overseas volleyball player, and sport coach, Janelle understands the importance of discipline and commitment. With a strong background in athletics she has found a passion for fitness and helping others create their own healthy active lifestyle tailored towards their hobbies and what they enjoy most. Janelle also strongly believes in the CrossFit mantra focusing on functional movements, creating a community and commitment through the fitness lifestyle. She loves showing clients different fitness challenges through Spartan races, Crossfit competitions, 5k runs, push up tests and half marathons and works with many aspiring volleyball athletes to help improve their individual skill for their future volleyball season. Janelle believes that everyone can find fun in any form of fitness and wants to help our society find that. Jeramiah is a Senior Performance Coach at the Willows Road facility. Jeramiah is an expert in sport-specific power development and conditioning, running movement corrections and strength training including coaching triathletes. Jeramiah played Div I college football. He enjoys working with all levels and aspects of fitness, and was voted PRO Personal Trainer of the year 2007 by his peers. Jeramiah does not accept any training packages. Jessi believes strongly in helping people to become the best version of themselves. Through positive motivation, and the desire to see people succeed, she truly wants to work with people at any stage in their own personal journey. Jessi believes in “being the change” and has a healthy, active lifestyle. She is passionate about CrossFit and also coaches at CrossFit Bel-Red, affiliated with PRO Club. Jessica believes in the importance of balance. She is very passionate about sports. She is a former collegiate basketball and volleyball athlete and recently retired from women's arena tackle football where she was named as one of the Top Wide Receivers of all time and was nominated for the Hall of Fame. Jessica has also competed in nine figure competitions having qualified for Nationals and has coached youth football for her son's team. Growing up in north Texas, sports were a way of life for Jessica; there she spent her days playing volleyball, basketball or running anywhere her two legs would take her. Her love for sports blossomed into a love for health and fitness while she attended Utah State University, where she got her degree in Kinesiology. Jessica loves to help others achieve their goals, whether it may be losing a few pounds, reaching a new personal best or maintaining a healthier lifestyle. Jordan is passionate about helping people reach their individual goals in a healthy, personalized fashion. Jordan's education as a sports conditioning specialist and experience as a collegiate track and field athlete helps him cater to a variety of people through his understanding of injury prevention and functional training styles. He enjoys working with a variety of people from young athletes to seniors. Josh has a passion for learning, teaching, and problem solving. As a Personal Trainer, strength and conditioning is the foundation of his expertise. Keeping up with the latest trends in health and fitness, he strives to offer a unique and valuable perspective to help navigate clients to their goals. His most recent notable achievements are helping a new client overcome 20 years of lower back pain, helping a client summit Mr. Kilimanjaro, and helping a female client to successful do a Turkish Get Up with a 28kg kettle bell. Justin is passionate about all things wellness. Through his education and experience, Justin wants to help people, from all types of backgrounds, achieve their wellness goals. Justin believes true wellness comes from addressing all aspects of life. He wants to help others address fitness and health to make it a part of their lifestyle. Justin believes proper resistance training is a huge part of a well-rounded routine. He also loves discussing nutritional habits and strategies to achieve your goals. During his free time, Justin enjoys learning about different topics, sports, and anything that has to do with the outdoors. Kaithlin is passionate about helping others reach their optimum potential in life and fitness. She believes that a quality life is not complete without movement and daily activity, eating nutrient-rich foods and making healthy lifestyle choices. She believes in the CrossFit mantra because it focuses on functional movements that translate to everyday activities, better equipping you for whatever life throws your way. She is passionate about surprising others to achieve what they never thought possible. She’s an experienced track and cross-country runner who also enjoys participating in other activities like Olympic weightlifting, high intensity training, hot yoga, and anything that involves the great outdoors. Kara wholeheartedly believes that exercise is the best preventative medicine and is essential to functional living. After completing her degree in Exercise Physiology at Florida State University, she wished to pursue a career in helping people gain the confidence and knowledge needed to effectively manage their health. Kara coached competitive gymnastics for 6.5 years and built a great knowledge base on proper form and body dynamics to ensure safe and effective training. She also has experience working in cardiopulmonary rehab in a healthcare setting. Kara tailors each exercise program specific to the individual regardless of fitness level because she knows exercise is different for everyone. She loves working with people, seeing them progress, and then see them be rewarded for all of their hard work. Karen has been in the industry over 30 years. She enjoys working with mature adults as well as all sport enthusiasts, especially snow skiing, snowboarding, and water sports. PRO Personal Trainer of the Year 1995. She enjoys helping clients of all ages feel confident in their body and maintain the functional fitness to achieve their goals, whether they're a collegiate athlete or brand new to exercise. She grew up swimming and competed as a varsity athlete in college. During that time, she was also a swim coach, taught swimming lessons and was a lifeguard. After her swimming career ended, Kathleen decided to pursue triathlon, and now enjoys coaching and competing as part of the PRO Club Triathlon Team. Her philosophy has been shaped by experiences in cardiac rehab and inpatient physical therapy settings. She believes that a holistic approach to exercise is the key to success! Kelsie develops fitness programming to build confidence and empower clients to get outside and take on new adventures. Leading by example, Kelsie utilizes her own fitness to enrich her life with hiking, mountain biking, snow-shoeing, recreational sports, and exploring national parks. While training to become a football star, his spark for a healthy lifestyle was when he became obese due to improper training and nutrition. He defeated obesity by losing 53 lbs. and earned his way to an Exercise and Sport Science degree from The University of North Carolina at Chapel Hill. Kevin’s training style uses exercise as a vehicle to progress the life of anyone he comes across physically, mentally, and emotionally. Kim is passionate about helping individuals achieve their short term and long term fitness goals by sharing her knowledge of health and fitness and creating a positive environment for everyone. Kim has experience working with strength training, sports specific clients, functional movements, weight loss, and post-injury rehabilitation. Kim's goal is to encourage individuals to challenge themselves while having fun. From teaching exercise classes to college students to teaching classes at a retirement center, she has worked with people at both ends of the spectrum. Kimberly’s positive attitude and high energy will greet you every day prepared and ready to go. She believes the best way to become an expert at something is to experience it yourself. This being said Kimberly is constantly trying to better herself through life experiences such as marathons, triathlons, new exercise classes, certifications, etc. Kyle began his CrossFit foundation in Ellensburg while attending Central Washington University.Experiencing the variety of training methods, coaching and programming at multiple locations has enhanced Kyle’s perspective on fitness and overall wellbeing. Kyle believes that exercise can not only lead to improved physical health, but can also improve spiritual and emotional health. As someone who follows a holistic approach to fitness in his own life, he enjoys sharing his knowledge and personal experience to help his clients build a solid foundation that integrates muscular strength and endurance, cardiovascular endurance, and flexibility. Kyle has worked as a personal trainer since 2011, encountering many different styles of exercises and goals. Through these experiences he has realized that fitness needs to be made comfortable, personable, fun, tough and most importantly individually focused. His ultimate goal is to help people maximize their time and effort in the gym. Kyle has helped a broad range of individuals meet their goals including clients with cerebral palsy, multiple sclerosis, osteoporosis, neuropathy, and ACL surgeries. He also excels in training for weight loss, weight gain, balance, strength, power, explosiveness and range of motion. Kyle enjoys using different variations of exercises, equipment, repetitions, time, and sets to keep sessions fresh. The results and satisfaction of clients are what continue to motivate him as a Personal Trainer. Kyle’s athletic interests are what initially developed his passion for health and fitness. He has won 2 King County district wrestling tournaments and a championship with a semi-professional football team. Kyle believes if he allows his clients the opportunity to learn new techniques and work hard, they can overcome challenges they did not think they could. Lindsey is dedicated to working with individuals of all ages and fitness levels to accomplish one’s own specific exercise goals. She is an All-American Division 1 Track & Field athlete who has an extensive background in developing Strength and Conditioning programs for individuals of many different backgrounds. She is motivated and enthusiastic about sharing her love of fitness with others and helping to show others how easy and fun it is to easily adapt it into everyday life. She is exclusive to Seattle. Lisa enjoys sharing her passion for health and fitness through thoughtful exercise prescription for all levels. She trains with functionality at the forefront, promoting improved strength and stamina for daily activities, better health, and stronger athletic endeavors. Lisa encourages and holds her clients accountable for better posture, movement patterns, improving cardiovascular fitness and all aspects of healthy living. She also enjoys teaching energetic cycling classes with fun, motivating music. Lisa’s experience in the fitness industry spans more than 20 years. She has been a group fitness instructor for a variety of class formats, but finds working with individual clients through personal training the most rewarding. Lisa focuses on giving her clients the skills, support and resources to help them reach their health and fitness goals. She strives to serve as an example of healthy aging and how regular exercise can help prevent or manage health problems and improve overall quality of life. Mac is enthusiastic about health and fitness as a way of life for his clients. He takes a logical and progressive approach to training and loves the process of helping his clients become as healthy and fit as possible. Mac has extensive experience working with clients of all fitness levels from athletes to those rehabilitating injuries to those focused on weight loss. He has enjoyed sports throughout his life including baseball, basketball, football, snowboarding and hiking. Maddie has an extensive background in sports and incorporates this knowledge into her training. In addition, Maddie has experience with functional training to help adapt and develop exercises to perform daily activities with ease and without injury. She integrates a variety of personalized exercised into a program that challenges, motivates, and excites the individual. She will be here to help push through barriers with a positive attitude and a commitment to develop and meet your goals. Marcus has had a passion for fitness since a young age and loves teaching others how living a healthy lifestyle can significantly improve one’s well-being. Marcus’s specific education in sports performance/conditioning and experience as a collegiate strength and conditioning coach have given him the tools necessary to cater to any fitness goals you desire. No matter what your goals are, Marcus will be there every step of the way motivating you to succeed. Marissa believes that in order to reach your goals you must first train to be mentally strong and the rest will follow. After losing more than 40 pounds herself, Marissa became passionate about health and wellness. She enjoys educating individuals on how to take proper care of their body through nutrition and everyday functional movements. Marissa is passionate about teaching individuals how to successfully change to a healthy and happy lifestyle by teaching self-love and confidence. She has experience with a diverse clientele including youth, geriatrics, bariatrics, athletes, obese and other special populations. Additionally, Marissa is fluent in Spanish and comes from the Midwest. Health and fitness has always been at Mataya’s core. From growing up playing soccer for 15 years to becoming an exercise science graduate at Western Michigan University and becoming a certified personal trainer through the National Academy of Sports Medicine, Mataya has always been fascinated with the human body and how it functions. Living a healthy lifestyle is a mental and physical journey that must be positive, fun and enjoyable. Mataya approaches her individualized programs around movements that compliment your daily activities, involving all planes of motion and progressing with strength and endurance training. Outside of the gym, Mataya enjoy spending time with her family and husky, kayaking, snowboarding, and hiking. Matt enjoys working with people at all fitness levels to help them achieve their personal goals. He has experience working with college level athletes in improving speed, agility, and strength. Matt’s interests include baseball, soccer, basketball, and running. He also has worked with mature adults as well as youth in the past. Maurice enjoys working with people of all fitness levels. He is experienced in Physical Therapy as a rehab specialist, in orthopedic injury post-rehabilitation, functional strength training, and bodybuilding. Personal Trainer of the Year 2003. Due to a full schedule, this trainer is unable to accept jumpstart clients. Morgan’s passion is creating healthy lifestyles through exercise and nutrition. She uses this passion with enthusiasm to inspire and empower each and every client to reach their individual fitness goals. Morgan grew up as a competitive gymnast and enjoys a myriad of sports. She has experience in tailoring individual fitness programs, coaching, group exercise, and weight loss. Morgan enjoys working with all ages and fitness levels from kids to seniors and from athletes to those with metabolic disorders. Nathan has a broad range of experience with many client demographics. He is comfortable modifying exercises to suit a client’s needs while concurrently working towards their fitness and lifestyle goals. One of Nathan’s strengths includes designing functional training programs that are specific to the activities his clients participate in, whether that be sport-specific training to improve athletic performance or lifestyle-specific training to improve efficiency of activities of daily living. Nick’s primary objective is to guide his clients in accomplishing their health and fitness goals in a safe and positive environment. He has a passion for helping others from all fitness backgrounds and has experience working with diabetics, as well as weight loss, bodybuilding, and strength training. He enjoys competing competitively in a variety of strength sports including: powerlifting, strongman, and CrossFit. Paola began her career as a Personal trainer and Pilates teacher in New York, following the completion of her Master's in Exercise Science from the University of Milan, Italy. She has been in the fitness industry for over 15 years and has worked in a variety of settings, from track and field to physical therapy. Her experience will provide a welcoming environment to all, and her training emphasizes the importance of a proper posture and a correct technique. Rachel’s goal as a Personal Trainer is to help her clients reach their full athletic and exercise potential. With seven years of experience working with a wide variety of clientele, she creates individual programming that is not only safe and effective to ensure lasting results, but also enjoyable to her clients. Rachel enjoys teaching cycling / TRX classes and leading small boxing groups. Rachel’s passion for an active lifestyle, and experience with the disease managing effects of exercise got her into a fitness career. She was inspired by her father who drastically improved his health through exercise and nutrition. She has worked with clients who have Heart Disease, Diabetes, and those seeking weight loss. As a former gymnast, aerialist, and soccer player, Rachel also works with those seeking more advanced levels of fitness. Rachel recognizes a fitness program should be designed considering her client’s health status and fitness level, interests, and lifestyle. She creates a plan that you can happily incorporate into your busy schedule, and still reach your fitness goals. Through support, accountability, nutrition and exercise expertise, Rachel helps clients get results. Her hobbies include Aerial Acrobatics, Snowboarding, finding quick healthy dishes to make, eating them and watching Netflix. Radhika is driven by incorporating fitness into the day-to-day lifestyle of her clients. For her, fitness is not a goal but a journey and a core building block of happiness and health. She loves getting to know the people, their journey and the emotions that drive them towards fitness and workouts. Radhika strongly believes that taking the plunge into the world of fitness allows us build that amazing connection with our body and helps us realize the true potential that our body has. As a mother of two young kids, she dealt with issues getting back to an active lifestyle and deeply understands the challenges each individual faces in realizing their fitness goals. Radhika grew up participating in various sports – badminton and swimming being close to her heart. Outside of work Radhika enjoys spending time with her kids and family, driving and motivating them towards an active and healthy lifestyle. Specialties: Weight loss, body conditioning (inch loss), fitness with metabolic disorders. Randy enjoys sharing his knowledge and skills with others while making it fun as they achieve their goals. His experience includes strength training, customized weight loss programs and believes in instilling success through dedication. Randy’s love for fitness started in high school when he played varsity football and basketball. Sports training showed him a positive change in performance as well as a way of life; attaining greatness through progression. Renae's passion and mission unite when she works with people of all ages by helping them in their journey by inspiring, educating, training, and encouraging them to reach their goals through adopting a holistic lifestyle. She discovered her passion to work in the fitness industry and preventative health after participating in various internships in cardiac rehab, wellness, and personal training. Robert is passionate about helping others achieve their fitness goals, and help change their life. He believes that with the passion he has for fitness, he can help, motivate, and inspire others regardless of gender, age, or fitness level. Playing football collegiately, and sports all of his life, Robert knows that it takes hard work and dedication to achieve goals not only in fitness, but in life, and he will do whatever it takes to help you achieve those goals. Robert is a Senior Personal Trainer. He is experienced in racquet sports, weight loss, hypertension, athletic training, swimming, and mountain biking. Robert teaches tennis to all levels. PRO Personal Trainer of the Year 2001. Samantha began her career in a clinical setting as an Exercise Physiologist in cardiac rehabilitation following the completion of her Master's in Exercise Science from Central Washington University. She's passionate about helping others achieve their fitness goals and strives to make exercise a fun and enjoyable experience for members of all abilities. Sam has been in the fitness industry since 2004. Relocating from Annapolis, Maryland, he takes pride in helping his clients discover how to incorporate healthy habits into their busy lives. Sam is passionate about motivating people to achieve their highest potential with an integrative approach that focuses on the whole person. He educated his clients to help them incorporate exercise, proper nutrition, and stress management to empower them to take charge of their overall well-being. Siera believes that individuals from children to seniors benefit greatly from age and goal appropriate exercise programs. Siera draws her knowledge from her education, sports background, and industry experience. As an athlete, coach and trainer, Siera is confident in creating a unique and effective exercise program for each and every client. She actively participates in basketball, volleyball, bodybuilding competitions, hiking, stretching/yoga, TRX and weight lifting. Sol enjoys working with people of all ages and levels of fitness who desire to improve themselves. As a former collegiate athlete, he draws his knowledge and experience from his extensive education as a graduate from Western Washington University’s Kinesiology department. He is a strong believer that staying in shape will help improve one’s outlook on life, as well as improve self-esteem. Starr has a lifelong love and passion for health and fitness. She truly believes that through exercise and adopting a more holistic lifestyle can greatly improve one's quality of life and overall wellbeing. She enjoys working with people of all ages and fitness levels, and strives to help them achieve their goals. Her personal goal is to help show how fun and an enjoyable experience exercise can be when incorporating it into your lifestyle. Steadman is fully committed to client transformation and brings a wealth of experience that allows each of his clients to attain their individual goals. He specialized in developing athletic power and has created programs for basketball, football, volleyball, and judo athletes. He is also a competitive powerlifter and thrives on helping others feel more powerful in their day-to-day experiences. Outside of athletes, Steadman specializes in post-rehabilitation. Talisa has always had a passion for being active and empowering others. While pursuing her Bachelor’s in Kinesiology, she ran track, winning 8 All-American titles. She then went on to begin her career as an Exercise Physiologist at a Medical Wellness Center, following the completion of her Master’s in Clinical Exercise Physiology. It is her goal is to encourage, educate, and provide her clients with the correct tools to complete their fitness goals. Tasha strives to help people from all walks of life, no matter your age or abilities. She is passionate about her own fitness endeavors which lends to her determination and commitment to help people help themselves. Tasha believes that living healthy should be a mindset, not a chore, and will construct, and individualize a game plan that will help you discover the activity and type of movement that motivates you to be healthy, stay in shape, and improve your overall quality of life. Taylor has been involved in competitive sports and dance her entire life and graduated with a B.S. in Exercise Science. She’s intrigued by what the body is capable of doing and all the things it’s able to achieve, no matter what shape or size. Taylor’s goal as a trainer is to educate the importance of a healthy lifestyle, improve overall health, quality of life and provide individuals with the tools and positive guidance they need to reach their health goals. Tory is a dedicated trainer who believes that the mind is just as important as the body when attempting to achieve a fitness goal. His sessions are challenging yet fun. He listens to the client and will design programs that are geared toward their desired outcome. Tory has trained high-level athletes in more than 8 sports, but specializes in football due to his collegiate and professional experience. Tory prides himself on bringing positivity to the lives of those he encounters daily. Travis has a background in strength and conditioning at the collegiate level, as well as functional training with special populations. He believes that a successful training program begins with a foundation of functional movements and cardiovascular endurance. A former collegiate baseball player, Travis enjoys all sports including football, soccer, basketball, and golf. As a certified Titleist Performance golf instructor Travis strives to improve one’s ability to have the most efficient golf swing. Tyler’s training experience allows him to utilize his diverse background of to find what best suits your needs. He believes that there is a workout for everyone to enjoy. These experiences includes group training, youth, collegiate sports, and military. Through college he worked with the athletes at WSU. Exercise is a fundamental part of staying healthy and injury free and with his passion for fitness, Tyler strives to educate through the workouts for you to understand how you’re achieving those goals. Some of his favorite sports growing up were racquetball and baseball. You’ll now find him spending his weekends hiking or cycling. Tyler’s main goal is to help people gain confidence to enjoy daily activities without worry or injury, and to teach a great work ethic in the gym that can be applied in real life. He knows that growth comes from achieving things one never thought possible, and that to grow is to succeed. Tyler's knowledge in training comes from three years of training Division 1 athletes in Washington State University's strength and conditioning program where he obtaining a degree in Kinesiology. Will is passionate about helping clients be active and reach their goals in spite of any setbacks - and to stay active. He believes that education, consistency, a positive environment, and finding types of exercise that you enjoy are essential to improving your fitness and longevity. Educating clients on correct movement patterns and exercise progression means focusing on perfection before progression in ones' training routine, with the understanding that perfect form may differ from one person to another. Zack’s personal mission is to help his clients and classes to achieve their most passionate fitness goals and maintain those results for a lifetime. It is his belief that with the right motivation and education, the possibilities for achieving fitness goals are endless. Zack grew up playing baseball and continues to play and he believes that finding something you're passionate about is key to staying active. Exercise should be used as a tool for stress relief and fun, and Zack has worked with a wide variety of clients which has helped him obtain the skills to create programs specific to each individual client and give them the tools needed to create and maintain a healthy lifestyle. In his spare time Zack likes to play baseball and root on his favorite teams the Seattle Mariners and Seattle Seahawks.